Stable and affordable access to electricity supply is a key factor for economic development. However, there are more than 1,200 million people that cannot access it, specially in rural areas, where 80% of the population worldwide has no connection to the grid. 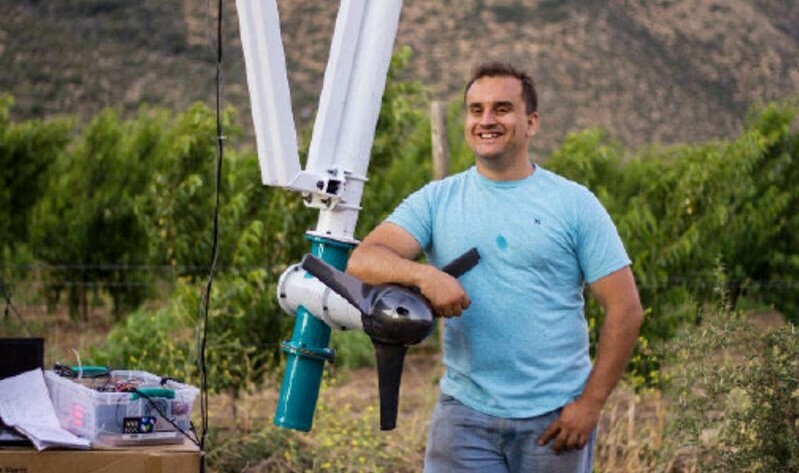 In order to help solve this intermittency and high-cost energy challenge, Emilio de la Jara, a Chilean civil engineer, has designed a groundbreaking turbine system to bring electricity to these areas. His proposal has granted him one of the awards for 35 Chilean Innovators under 35 2016, from MIT Technology Review in Spanish. Emilio De la Jara is Capta Hydro CEO, the company from which he develops and sells his systems designed for optimizing the kinetic energy of water that runs through artificial canals. His turbines generate electricity at small scale in areas outside the electricity grid that can be used by agricultural companies close to the canals. His first product is a hydrokinetic system that can operate at different depth and speed while generating between 5 kW and 100 kW per installed turbine. This power is enoguh to supply irrigation projects in isolated towns, villas, houses and vineyards. The main advantage of this project lays on its design, capable of turning part of the potential energy into kinetic energy without modifying the canal. This feature allows “significantly increasing the speed locally, around the turbine blades, which also increases the amount of extractable power”, De la Jara explains. Besides, a software system developed by De la Jara himself optimizes the performance of the turbine wheel in many conditions, which “maximizes the exit power and prevents cavitation”. To Brian Bergstein, MIT Technology Review assistant director and member of the jury at the awards for 35 Chilean Innovators under 35 2016, from MIT Technology Review in Spanish, this young civil engineer outstands by his “wit and intelligence” and calls his project “truly innovative”. Do you have innovative and disruptive ideas like Emilio De la Jara? We would love to help you make them a reality!